Less than 24 hours after their last update, the French MOA has announced an additional 8 outbreaks of HPAI H5, all occurring in Landes. H5N9 has been identified in at least 3 of these outbreaks, while the subtypes of the others are still being evaluated. 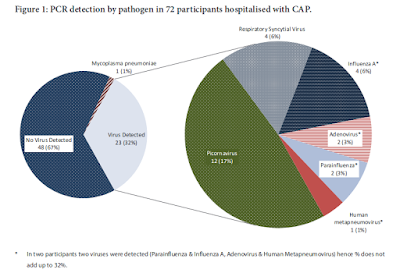 With more than 5 dozen outbreaks on the list, the French MOA is now segregating details by department, which you can access at the link below. I've included the narrative describing the new outbreaks (since yesterday) along with the summary. In total, to date, 61 of highly pathogenic avian influenza outbreaks in poultry were detected in 6 southwestern departments of France. - On December 21, a highly pathogenic avian influenza has been identified in Cagnotte following a clinical suspicion in a duck feeding workshop. 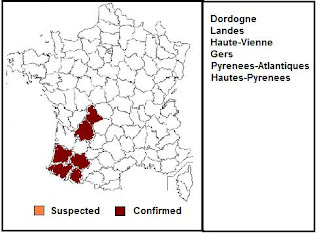 4 more outbreaks were reported in the towns of Cazalis, Hauriet, Mugron and Montsoue. The strain of Montsoue outbreak was identified December 21 as a highly pathogenic H5N9 influenza virus. Five (reportedly) new strains of avian influenza are involved in these outbreaks, including three HPAI H5's (H5N1, H5N2, and H5N9) and two LPAI H5's (H5N2, H5N3). All are reportedly new strains - of `European Origin' - and not related to the Asian H5N1 which is linked to often deadly human infections. We've yet to see a full analysis of these new viruses released, or an explanation of what led to having five - apparently unique - avian flu viruses emerge across Southern France in a matter of a couple of weeks. Hopefully we'll get more specifics in the days and weeks ahead.